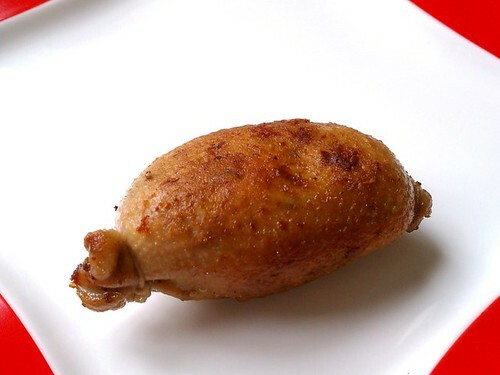 Duck Embutido or Sausage ~ I Can Do That! tablespoons of rendered fat. The heart and giblets were coarsely chopped and blended with the emulsified duck meat. I ran out of sheep casings and wrapped the mixture in the duck skins mostly from the neck and drumsticks. 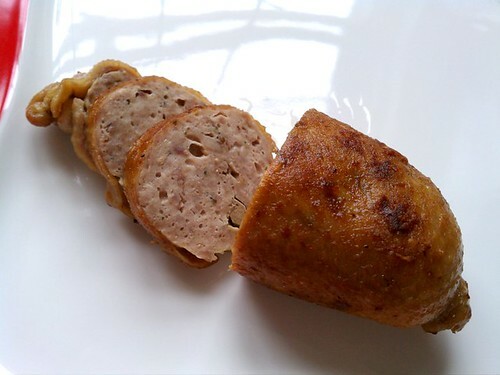 The simply seasoned sausage is then fried in its own fat until golden and crispy. I avoid saying this but this sausage truly deserves it...OMG! It's the most yummy thing I have ever eaten, the crispy skin adds to its overall deliciousness. It's heavenly, trust me. Place cubed duck meat in freezer for 20 minutes. Season the skins with 1 teaspoon salt and half of the white pepper, refrigerate. If using, coarsely chop heart and giblet; cut liver into 4 long pieces; refrigerate. In a food processor, process duck meat, duck fat, the remaining salt, garlic, and the rest of ground white pepper, until finely minced and emulsified. Transfer mixture into a small bowl and mix in the heart and giblet. Divide into 4 portions, shape into small logs, inserting a piece of liver in the middle. Stuff duck skins and tie both ends of embutido with kitchen strings. Fry all sides on medium-low heat in a cast iron skillet until golden and crispy. Cool slightly before slicing. Wow, just wow. That looks amazing. really wow! i want to try it. your site and everything in it is great! really great! great great great!